Welcome back to the Rotten Ink Arcade. 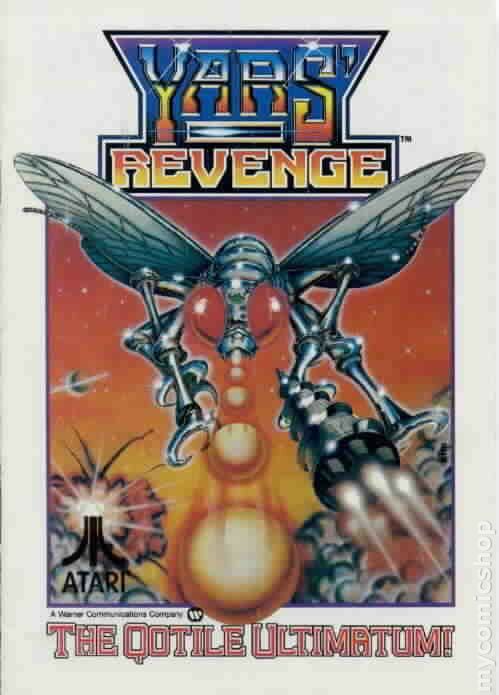 For our second update of 2016, we are going to take a look at Yars’ Revenge, the super popular game from the early 80’s created by Atari! Like most kids of the 80’s and 90’s, I loved to go to the arcade and hit the toy stores and video game stores, playing video games and shopping for the next pixel quest I could embark on. One of my favorite video game stores was Funcoland, a cool mall chain store that used to sell regular Nintendo games for dirt cheap. I can remember me and my friend Jason Gilmore going to the mall just for this store and leaving with handfuls of NES games as well as Playstation ones. It’s such a shame that Funcoland was bought out by Game Stop (as was EB Games) who closed all the locations and became one of the biggest soulless video game stores in history, that overcharges for used games and drives up the prices on games to warp the market. I can also remember for years going to the arcade in the Dayton Mall with my brother Bryan and playing all types of games from WWE Wrestlefest to Guns n Roses Pinball and having a heck of good time a our arcade of choice, Crazy Cats, by this time sadly had been put out of business by the fine folks who run Kettering, Ohio who gave that poor arcade a hell of a time cause they didn’t want teenagers hanging out in front of Krogers who shared the strip mall with them. Nowadays arcades are making a comeback here in the Dayton area with Hole In The Wall bar, Retro-Media Arcade and Scene 75 to name a few of those popping up and sharing the digital arcade love. Game Swap in Kettering also has its fair share of arcades, and I am proud to say that I spearheaded that and even in my own little way helped bring this popular style of gaming back to the area. Game Swap has many different machines up for play like Donkey Kong, Pac-Man, Ms. Pacman, Donkey Kong Jr., Popeye, Captain America and The Avengers, Super Contra, Hydra, Centipede, Superman, Marvel Superheroes and so many others! Sometimes, if I get to Game Swap early and get things done and have a pocket full of quarters, I will play of few of the arcade machines before open, Most of the time I play Superman or Street Fighter II Championship Edition. I miss the days of the classic arcades but thanks to places like Game Swap and Arcade Legacy, the retro arcade will live on for a new generation of gamers to play. 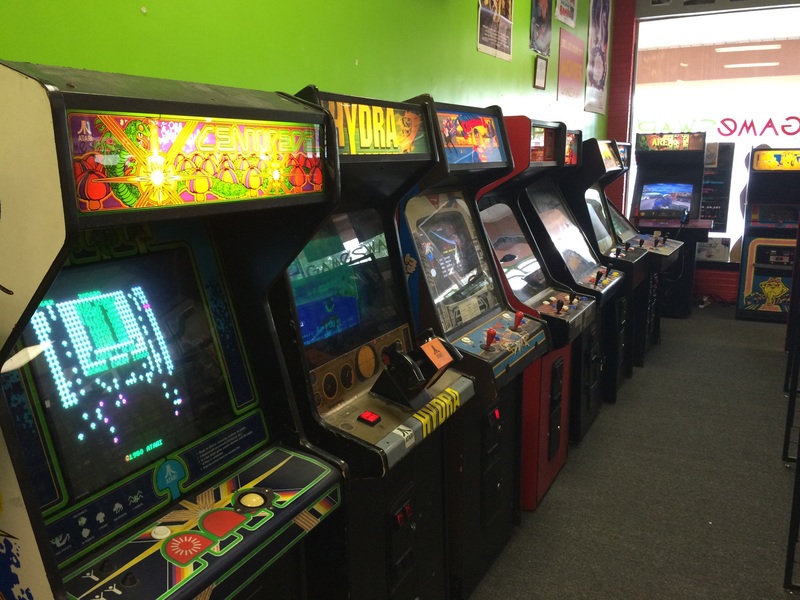 Below are some of the arcades that are at Game Swap, so check out the selection and connect with your inner gamer. 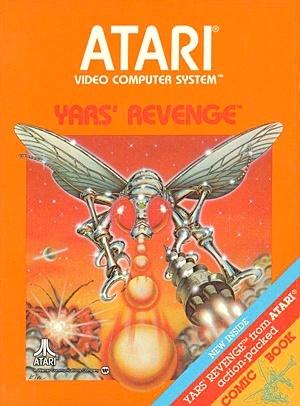 In 1982, Howard Scott Warshaw created a video game for the Atari 2600 that was the console’s top selling original title for the whole run of the 2600, and this game was called Yars’ Revenge. 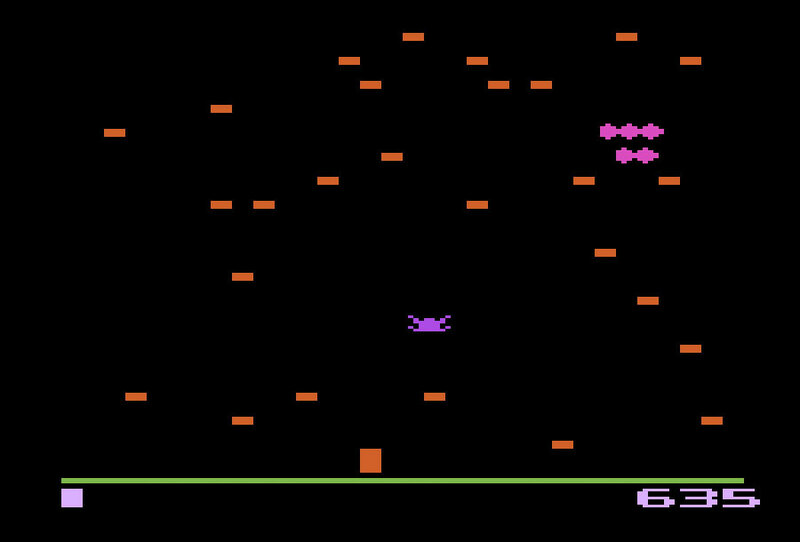 The game started as a licensed port of a game called Star Castle, and after so many changes to the code, it took on a life of its own as Warshaw ended up just making a new game he called Yars Revenge! One video game urban legend says that Warshaw named the game’s home planet Razak basing it around the C.E.O. of Atari, Ray Kassar’s, name and that he did so to see who would be a snitch and rat him out to he boss! The game’s plot has you playing a Yar who must get past a force field and pin point the base of your enemy who must be killed by a giant cannon. The first time I played Yars’ Revenge was at Bard Burn’s house, a neighbor who lived across the street. I can remember being very bad at the game but trying like hell to win. When I was an early teenager, I can remember playing the game again at my Grandma & Grandpa Brassfield’s house and doing a little better while my cousin Nathan watched me play. 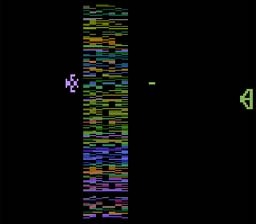 Now as an adult and thanks to Game Swap, I got the game as well as an Atari 2600 and have relived playing the game many times. When it came out, the game was a hit with fans but many critics were not too kind to it calling is boring and comparing it to a sleeping pill! But love it or hate it, Yars’ Revenge has made it’s mark on the world of Video Games and remains a classic title from the days of cart games. Besides the Atari 2600 video game and Warner Brothers promo comic, some other merchandise was made around Yars that includes a record that had a radio drama based around the game as well as the game’s “theme” song! 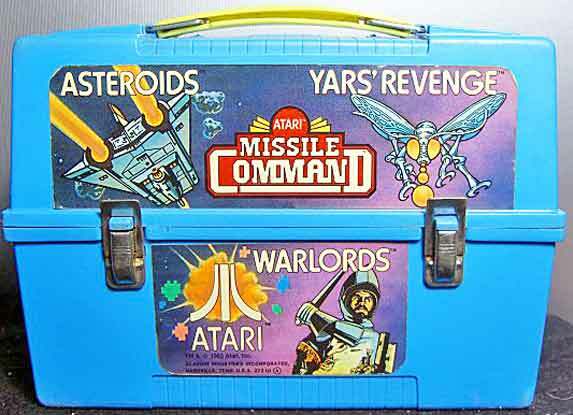 A lunch box was made that showcased Yars alongside Missile Command and Warlord among others. 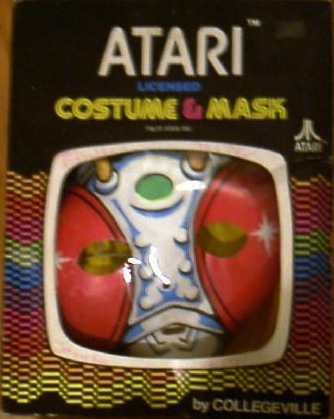 Also a Ben Cooper Halloween costume was made allowing kids to become a Yar themselves. Over the years ports, remakes and reboots have been made for consoles like Game Boy Advance, Atari Flashback and Xbox 360. 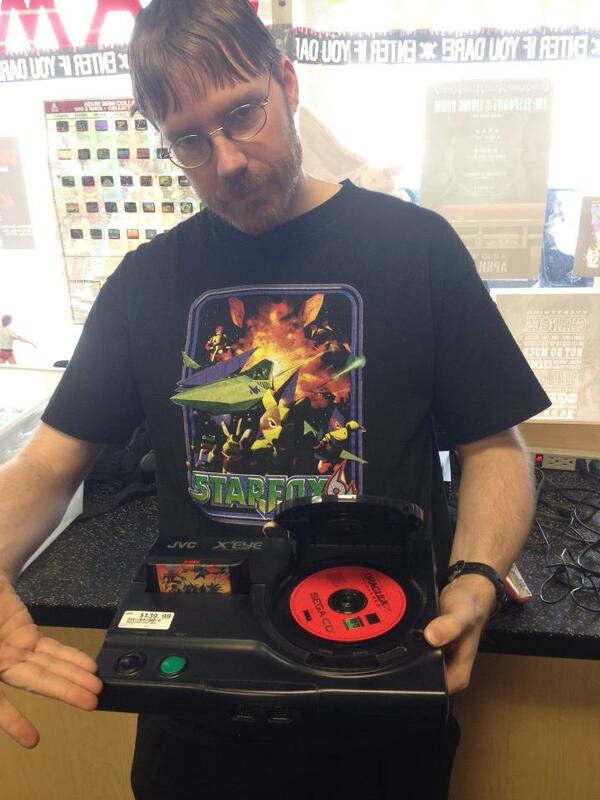 I have even heard stories of fans creating their own Yars arcade machine! 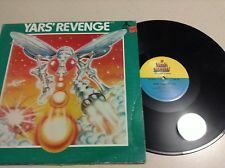 So while Yars’ Revenge might not be a household name for modern gamers and also might be forgotten and not yet discovered by others, one cannot downplay its impact on the world of home console gaming as it sparked some cool merchandise. Back in the 1960’s, America and Russia had a race to see who could send a human to space and bring them back alive to share what they saw and to have bragging rights on what nation was the first to do so. Many failed attempts were made that cost the nations money, time, machines, lives and lots of poor primates were lost in the unsuccessful attempts. 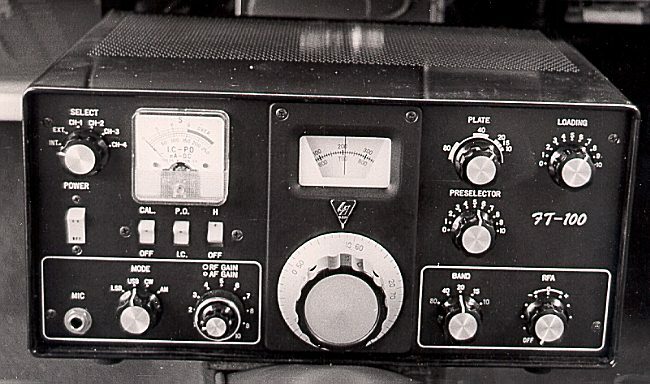 Also in the 1960’s, amateur radios were very popular and many people spent time trying to pick up the messages used by both sides. The Judica-Cordiglia brothers from Italy did just that on the Russian side and captured the last broadcasts from many of the poor souls who were sent into space and never returned. They heard many sad broadcasts from astronauts who sent out SOS signals as they drifted out into deep space, ones running out of oxygen and suffocating. It’s sad to think about these poor people who died in a space race between two nations who had a beef with each other. The one audio broadcast that really got to me was recorded in 1963 and was the voice of a female Russian astronaut who was in a shuttle heading back to Earth as it’s catching fire and breaking apart in the atmosphere and she is calling for help and talking about seeing fire and how hot she is inside her metal death prison. Her words are in Russian but her panic frantic tone of voice lets you hear the fear in her voice and makes me sad to think how scary and terrible her last moments alive were. I put myself in her place and a shiver went up my spine as you think about the feeling of being alone and helpless and knowing that your fate was moments away. I should also share that while many people think this recording is real, it does have its detractors who claim that the woman’s voice clearly has an Italian accent and that the brothers hired a woman to make the recording to keep up the local and national fame they got from sharing these broadcasts with the news. I for one don’t know if this recording is a fake or not and will end it by saying if it was real I hope this poor woman’s soul has found rest. Moving away from depressing radio use, let’s take a look at a CD that a friend picked for me to listen to. My friend Garrison Kane is a fan of Nintendo and collects all types of products from the games to mini figures based on their characters. 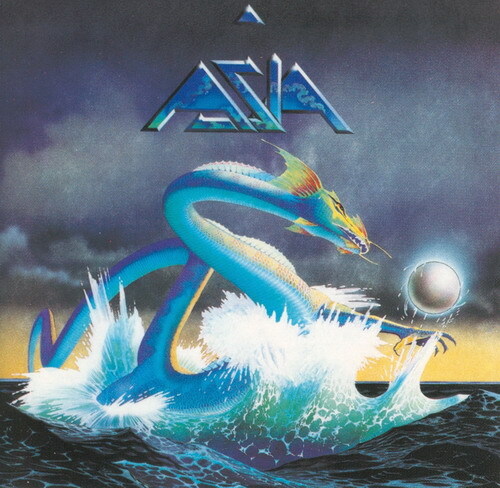 With this update being about a video game, I figured that this would be a good time to listen to a CD that he picked for me to listen to from his favorite band and his favorite album by them, that’s Asia with their 1982 self title release. The first song of this disc was Heat of the Moment, the only song I really knew from the band as it is played on local soft rock radio stations to this day. This was a nice way to start this listen to this album as this song is pop rock fun with a hint of bands like Alan Parsons Project and Toto. 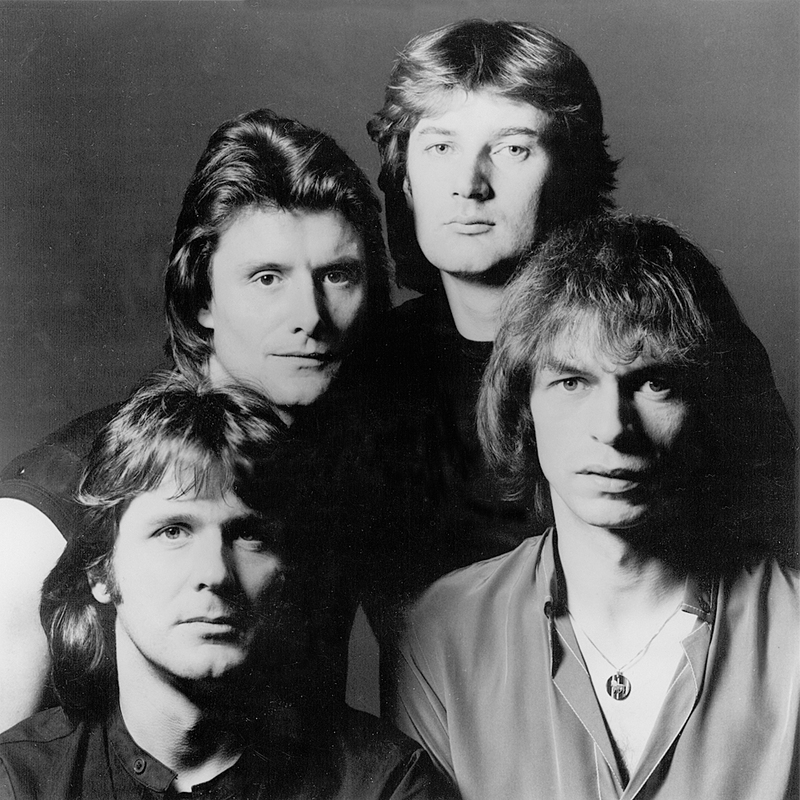 What follows for the next eight tracks is soft rock goodness that is sure to please the ears of those who like catching lyrics and smooth melodies of rock stars who know what they are doing when playing their instrument of choice. The music to the song Time Again is really good and was caught in my mind after hearing it. The lyrics are okay though a little cheesy, but I would say that this is one of my favorite songs off the CD alongside Sole Survivor, Heat Of The Moment and Cutting It Fine. To be honest, none of the songs on this one are bad, and I really enjoyed listening to it while I wrote this blog as I felt it was great background music that made focusing a lot easier than having a heavier band’s CD on. I should also say that some songs like Wildest Dreams have messages about war and the way TV covers such events, or at least that’s what I got out of the song! Steve Howe is a very solid guitarist, and I find that his work on these tracks holds up, as does the piano work of Geoff Downes. I will say Garrison picked a really good CD for me to listen to as I enjoyed almost all the tracks and will listen to this one again for sure. I wonder if Atari in 1982 ever thought about putting music by Asia in one of their games or at the least making a game based around them like they did with Journey in 82. Wait, Yars’ Revenge, Asia’s self titled album and the video game Journey Escape all came out in 1982…what a year that must have been! Well we are at the point of the update where we will be taking a look at the comic book based on the subject, and I must thank a customer from Game Swap Kettering for giving me this comic to review. That was super cool of him, and this update is for you, my good sir! I want to remind you readers that I grade these issues on a star scale of 1 to 4 and am looking for how well the comic stays to the source material, its entertainment value and its art and story. So let’s plug in our Atari 2600, grab a trusty joystick and see what Warner Brothers has in store for us with this promo comic based around Yars’ Revenge! A new Yar recruit enters the office of his commander who decides to give him a history lesson of why they are at war and who they really are. You see their race comes from normal houseflies that hitched a ride on a spacecraft that later crashes in the Razak solar system where those houseflies mutated into Yars. Now this young recruit gets his mission to attack their enemies, The Qotile, and try to bring down their force field so that they can blast them with a Zorlon Cannon and take back their lost land and live peaceful lives once more. It ends with the Commander Yar hoping that this war will come to an end soon and no more lives of his people will be lost. This war in a galaxy far, far away was not fought by Luke Skywalker or even Captain James T. Kirk and his crew but was fought by a race of super flys called Yars. The plot of this 9 page comic is super simple and is just the plot of the video game for the Atari 2600 as we find out that the Yars, who are mutated Earth houseflies, are at war with an unknown race called the Qotile who blew up one of their planets as well as made a base near it to keep attacking the Yars. The issue ends how the game begins and has you going out into space and trying to fight their base and its force field. The Yars who are this the comic’s main characters seem like a peaceful race until they are pushed to fight, and when they are pushed they put on metal armor and blow stuff up with the help of their massive cannon. The humans, who have a cameo at in the issue, seem clueless and are just fill-ins to show how houseflies made it into space. The Qotile who are faceless and are not seen at all seem like a bunch of buttheads who love war and destruction and seem to be the bullies of that galaxy! I really wish more modern game companies would get behind giving the player a comic based on the game they had just bought. I mean imagine getting a comic book based on the newest Assassin’s Creed game or one for horror games like Until Dawn or Summer Camp! While comics based on video games are being made, they are full size issues that pack a $3.99 or $4.99 cover price and are coming out via companies IDW and Dark Horse. While these are fantastic comic series with top notch stories, they are not a free promo comic inside the video game you just bought as I feel most modern game companies are pushing for giving the buyer less with their digital only agenda. The cover for this comic is classic and is taken from the box art for the game. The inside art and color is fantastic and is done by the team of Frank Cirocco, Ray Garst and Hiro Kimura who make this little mini comic shine for what it’s suppose to do and that’s teach the player the back story of the game. Over all to sum it up, I would say worth a read for fans of the game. Atari giving out promo comics might be a thing of the past as are video game companies giving away any cool promo stuff with the game you bought without getting a more expensive edition that they can charge you for. But while things always change, it’s the excitement of what the future holds that keeps this video game player, music listener, comic reader, movie watcher and Horror Host maker & fan hyped for the unknowns of those creative media worlds. Thanks for reading this quick little update as our next update will be about Marvel Comic character Black Goliath! So make sure to come back for that one so until then make sure to play a video game, read a comic or three and as always support your local Horror Host! Welcome to Rotten Ink Home and Garden Edition. Today’s topic is centipedes and how to rid your garden of them, but first before we learn how to get rid of them we must first come to understand them. 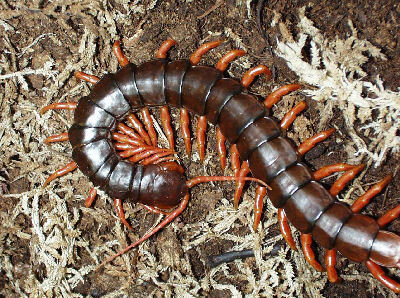 Centipedes are arthropods who are elongated metameric little fellas who can have 20 to over 300 legs! They are carnivorous and live for 3-6 years given what species they are. They are eaten by mice, snakes, birds and even beetles. Some centipede bites can be fatal to small children as venom is used when they bite; in adult humans a bite will just cause the person to be ill. 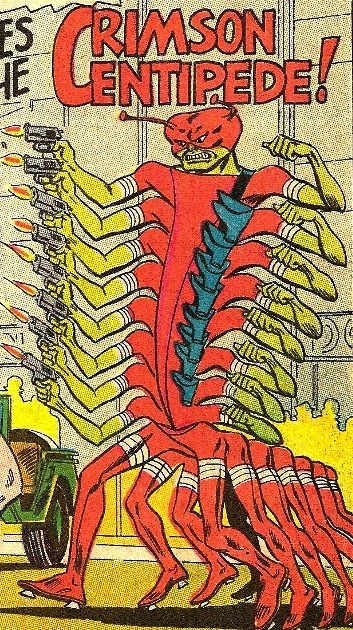 Wait a minute, this is not the centipede we are talking about for this update!!! Oh we are talking about The Human Centipede, that shocking 2009 Horror flick directed by Tom Six about the mad doctor who sews peoples mouths to others’ butts to make a weird human centipede thing right? Wait, I am wrong again. We have to be talking about the DC Comics character Crimson Centipede who was created by Ares The God of War to to fight Wonder Woman and rob banks….wait….Oh I know what the topic is about! In 1981, Atari produced an arcade machine that was designed by Ed Logg and Dona Bailey that had you defending against the likes of centipedes, spiders, scorpions and fleas in a field of mushrooms, with the player being an elf trying your best to defend yourself. This game was called Centipede. The machine was a hit, and many players of the day dropped many of quarters into it. For many years, alongside the likes of Pac-Man, Space Invaders and Pong, it sat as one of the kings of the arcades. Nowadays classic gamers still enjoy playing this simple yet challenging game, and any retro arcade place must have it among the games to play. Game Swap in Kettering has this game, and when it first showed up I was lucky enough to have my name on the score board. Now, a few years later, I have been knocked off. One thing that sets Centipede apart from other arcade cabinets is the fact that it uses a trackball for movement and not the traditional joystick; this gave the player the feeling of more control of their character. 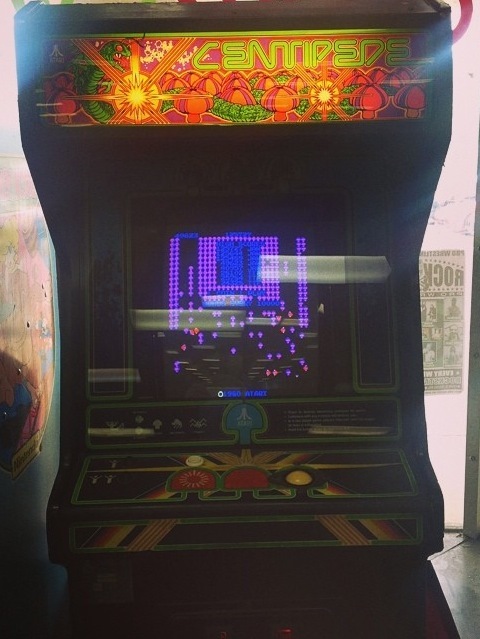 So for this blog I decided to grab a lucky quarter and head to Game Swap and have a showdown with the Centipede arcade machine! I really enjoy the game and on this day, January 12, 2015, the air was cold and it was after a freezing rain storm. I went to Game Swap Kettering an hour before it opened and popped my quarter in and began my mission of conquest. And after playing it for several minutes, I ended up making it to the board but only in the # 4 spot! But nothing can beat the sounds of several arcade machines playing at the same time. If you’re an old school gamer, you know what I mean. I should also note that at Game Swap as of this posting there is a feud going on to have their name in the top three spots and its between Garrison Kane, Josh Weinberg and a customer named Dan Little, this far Dan has the # 1 spot and looks like the others have their hands full to claim it. Beside the arcades, the one place many people could play Centipede was at home thanks to their Atari 2600! The cart was put out by Atari themselves and came packaged with a special DC Comic Book that is the comic we will be reviewing this very update! 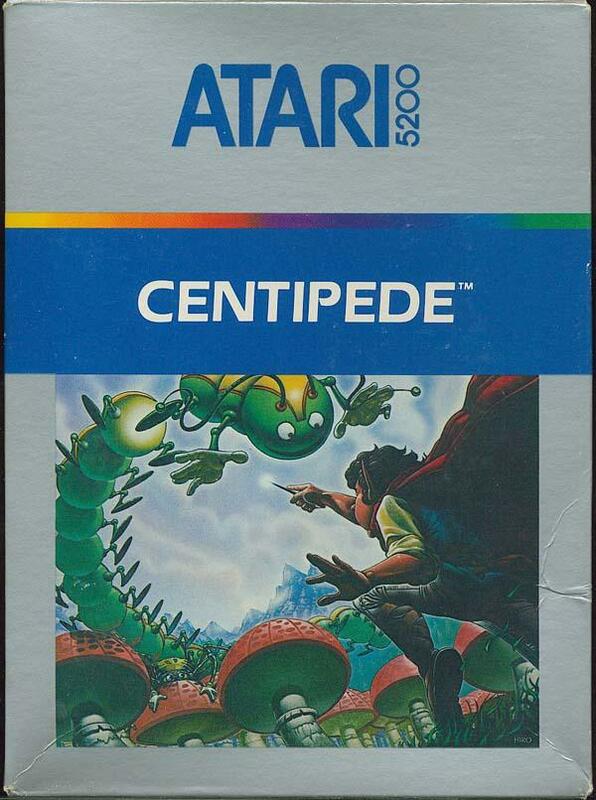 Centipede was a solid selling game for Atari 2600, and those few kids that I knew who had a 2600 all had this game. While the port of this arcade game to home console was a fun play, it did lack the smoothness of the arcade as well as the graphics were below mind blowing. 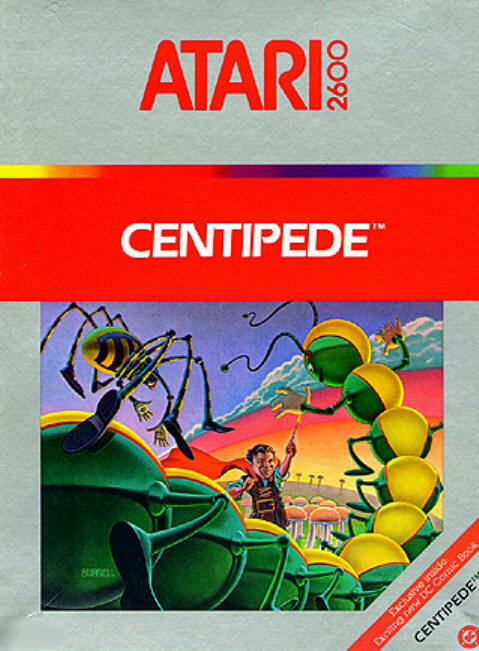 But I am sure if you own an Atari 2600 now or even then, I would almost guarantee that you have or had a copy of Centipede, and you have some great memories of playing it. 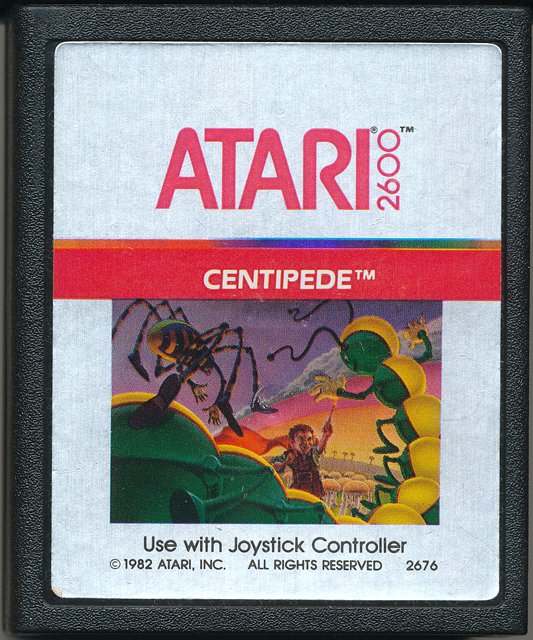 If you didn’t have an Atari 2600 or an arcade near your home there were many other ways to play Centipede at home as it was also ported on Atari 5200, Atari 7800, Commodore 64, Game Boy, Game Boy Advance, PC and many others! 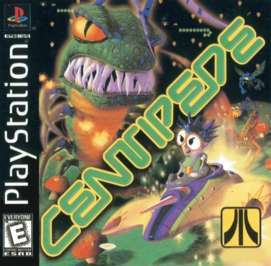 A new and improved version of Centipede came out for PC in 1998 and for Sony Playstation and Sega Dreamcast in 1999 that changed the vibe and core of the classic game. Instead of the Elf, the player now played as a ship called Shooter who was fighting the bug and mushroom invasion. I can remember the hype being around the reboot game, and I for one bought it when it was released as well as the many other PSX reboots that followed like Frogger, Pong and Blaster Master. 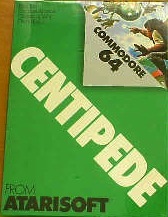 So no matter how you look at it, if you play video games at all there was many of ways to play Centipede at home! 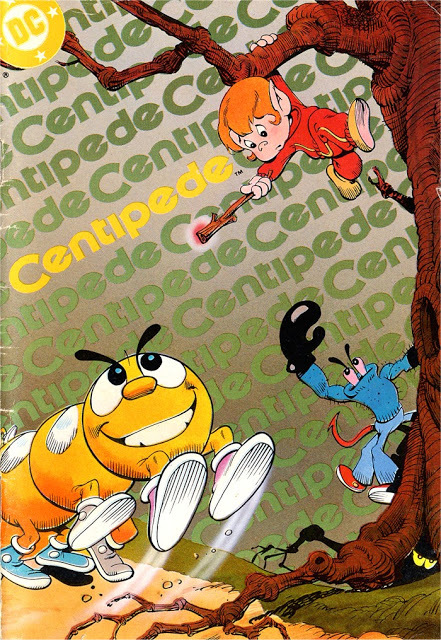 So we took a quick look at Centipede at the arcade and home consoles, and now I am thinking it would be a good time to take a look at the mini comic book made by DC Comics based on this video game! Now for those of you who don’t know and are wondering why and the world did DC make a comic based on Centipede to be a give away when gamers bought the game, the answer is simple: as DC’s parent company also bought Atari and to modernize and utilize their assets, they had DC help make an extra bonus for those who bought the game. So with that I need to thank Game Swap Kettering for having this comic in stock and I also need to remind everyone that I grade these on a standard 1-4 star rating and base it on how well the comic stays to the source material, it’s entertainment value and it’s art and story. So grab a pocket full of quarters, cause we are headed to the DC Comic Arcade to read a little Centipede and maybe even get the top score! Oliver is the littlest elf of his village on Mt. Mushmore where he and his parents harvest mushrooms. Oliver’s best friends are insects that live in the forest like Spider, Scorpion, Flea and Centipede and they all play games and eat berry jam and mushroom bread together. Well one day the evil Wizard who lives nearby turns all of the mushrooms into poison toadstools as he hates shrooms but loves stools! Oliver’s Dad gets all the other elf villagers together and leaves Oliver to watch over the family farm as they all storm his castle and try to get him to stop his evil ways. 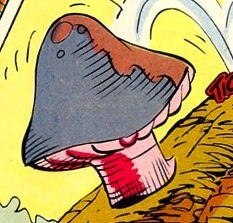 This of course backfires, and all the elves are turned into Toadstools! 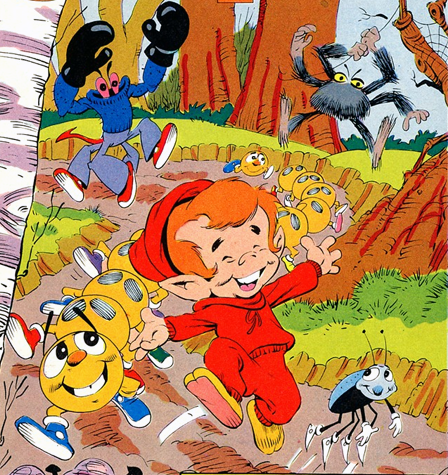 Oliver is the last elf left, and the Wizard goes after him and a chase ensues that ends up with Oliver getting the Wizard’s wand and the Wizard using his magic glance on his insect friends to turn them bad. They hunt Oliver down in the forest and against their will, they are out to kill their little elf friend! But Oliver uses the wand and turns his attackers into mushrooms, and right when he is about to turn the wand on The Wizard the two come to terms and The Evil Wizard turns his frown upside down and becomes friends with the elves that are turned back into humans. This is a pretty fun promo comic made by DC for Atari and almost has a Smurfs feel to the whole thing that gives it a family fun vibe. The story is pretty simple and true to the spirit of the game with a evil wizard making toadstools and turns the forest insects into blood thirsty creatures. The world’s only hope is the smallest elf in town who outsmarts the Wizard and saves the day. Oliver is a likable hero who is very simple and enjoys life with his insect friends and helping on the mushroom farm his family owns. While he is the smallest elf in town, he has a big heart and courage to back it up. Think of Oliver like this Willow Ufgood from the film W.I.L.L.O.W. meets Wally The Wizard with a dash of Papa Smurf. The Centipede and the fellow creatures of the woods are fun loving and only turn evil when a spell is placed on them. One weird thing is that the Centipede’s whole body is made up of tiny circle smiling faces that when they come apart each section has a mind of its own. The very evil Wizard is your generic old sorcerer who hates all the nearby villagers and wants to ruin their crops in order to plant his own and can do so thanks to his trusty magic wand. Without the wand, he is no threat and in fact even with it all he does to stop you is turn you into a toadstool, but of course he is taught a lesson by Oliver and he turns his frown upside down. 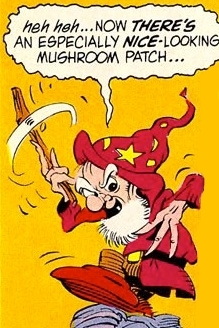 Think of the Wizard as a cheap imitation of Gargamel from Smurfs with the look of Jarvis the Cookie Crisp Wizard.This comic is really well done and gives more depth and character to a video game with zero story on screen and tiny spirits as the characters! DC could have turned this into a kids comic series, and I am sure it would have done better then the likes of Atari Force, a series DC made that we will have to cover at some point here at Rotten Ink. The art is done by Howard Post and Robert Smith and looks fantastic and holds the charm of a classic 70’s kids comic! To sum it up, this is a great promo comic that did its job in adding something more special to the source material. Check out some of the art samples below and enjoy the video game inspired goodness. 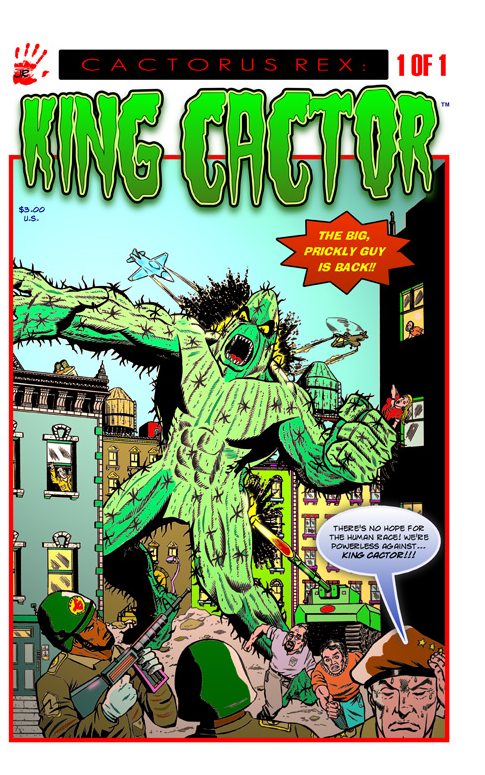 We finished with Centipede way early so I figured why don’t we take a look at an Independent Comic I got off the website Indy Planet that is based on the classic Sci-Fi comics of the 60’s thats called King Cactor! So let’s go leave the safety of Oliver the elf and see what a giant angry monster can do! King Cactor is a giant cactus man who has just emerged from the hot sand near Las Vegas and is on a destructive path going towards towns. The army is trying to step in and stop him, but to their horror, nothing they have is fazing him! By the time he hits a small town, the army drops a nuclear bomb on him killing the over a thousand residents and barely hurting the green prickly skinned beast! The general has no other options as he calls on a creepy scientist named Professor Tarterez who spends two weeks and over two billion dollars on an aircraft that he tells them will drain the water from King Cactor’s body leaving him a dried up husk! This is a set up as Tarterez uses the craft to gain mind control over the giant beast and use him to destroy all the humans! Professor Tarterez thinks he is about to rule the world with his mind controlled King Cactor, but he forgot about Benefield, a solider who never trusted him and snuck aboard the craft and saves the day! As the craft crashes to the ground with both Professor Tarterez and Benefield inside, King Cactor heads into the heart of the desert away from towns and people. But like any good sci-fi story, this is not the end as it shows that Benefield is alive, but is he human? This is a fun science fiction throwback comic that captures the feeling of a 60’s comic books that inspired it, and I must say that I fully enjoyed this comic and all the cheesy action it packed inside the pages. The story follows a giant monster who has returned after a few years of hibernation and is back causing destruction. The military, who is powerless against it’s rage, has to count on an evil Professor who will do what he can to make things go his way. King Cactor is a giant cactus monster who is super strong and can shoot needles and can survive all types of bombs and guns! Professor Tarterez is an evil man who looks like the Devil and wants to rule the world and kill off many human lives. One thing about him is that I am not sure why he is so anti fellow human. Tarterez is clearly a bigger bad guy than King Cactor as he is doing is evil deeds with a human mind and it’s been thoughtout. The Army, who are the good guys, are noble but are also outmatched by the pure power of King Cactor, and this makes them have to do so drastic things like bomb a whole city killing everyone who lives there. Benefield is clearly the issue’s true hero as he cares about his fellow man and even sacrifices his own life to save the world from more destruction. The comic has a great pacing, and I would read every issue if this was to be turned into a full fledged comic series. 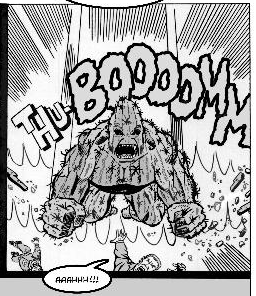 I should also say that King Cactor was used in another comic before this issue called Tales From The Seventh Galaxy # 1 making this the big guy’s second comic appearance. The art is done by Thomas Ahearn and looks fantastic and captures the right feel for this style of comic. I say check out this independent comic if you’re a fan of old school sci-fi comics starring larger then life giant monsters. So from an arcade classic turned into a DC comic to a giant Cactus monster who runs amok, this update is coming to an end, and I still must say I could not knock Josh Weinberg off the # 1 spot on the Centipede arcade machine at Game Swap Kettering, but one day he will drop to the # 2 spot and my name will be the new champ of the machine! Our next update will be all about that lovable rich blue cartoon dog named Foofur! So until then, read a comic or two, visit your local comic shop, play a classic video game and as always have a good time!